Tunis is one of our favorite cities. We love spending hours wandering around the compact medina. The authentic shops, the ancient Islamic architecture, the Turkish baths, the French influence, the smell of jasmine in the air, and the continental-style cafés and restaurants all blend together to form a rich experience for all five senses. But there’s more to Tunisia than Tunis. Here are six worthwhile destinations for venturing out of Tunis. 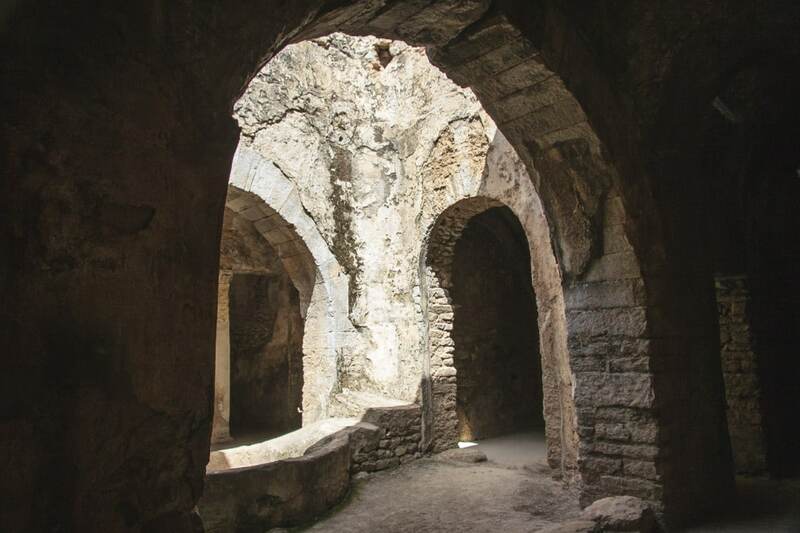 Carthage was once one of the most powerful cities of the ancient world. 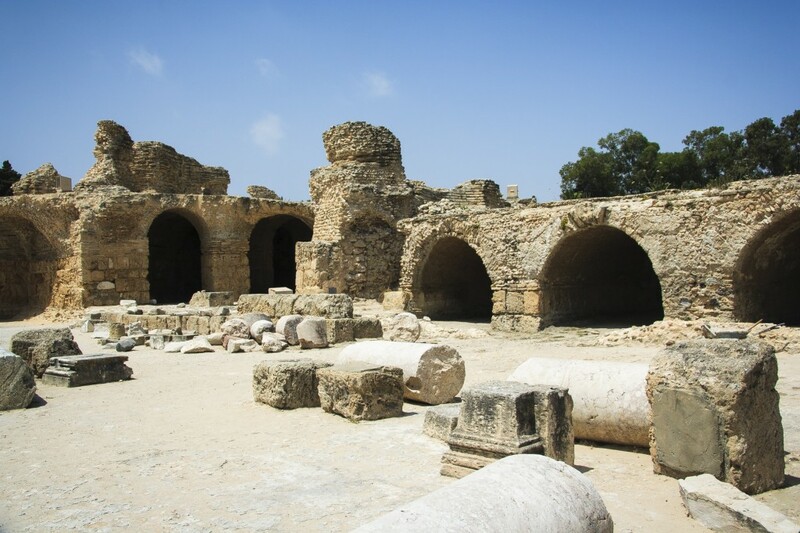 Carthage was home to the great general, Hannibal, who lead his army across the Pyrenees, southern Gaul, and Alps to take on the Roman Army during the Second Punic War. There are several notable ruins throughout Carthage. The amphitheater was one of the largest in the Roman Empire. A number of overgrown Roman villas still exist. The archaeological site of Carthage is a UNESCO World Heritage Site. 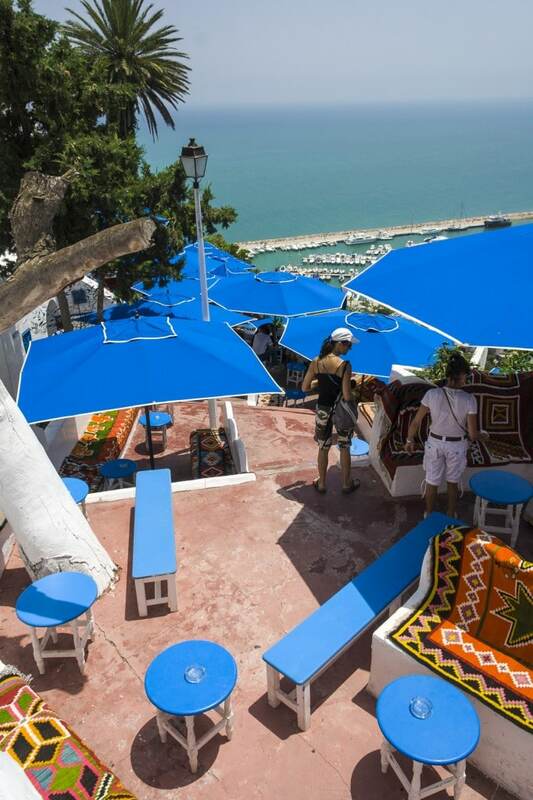 Sidi Bou Said is a quaint Mediterranean town just north of Tunis. Built on top of high cliffs overlooking the Gulf of Tunis, the town’s charm stems from it whitewashed buildings with blue trim and its relaxed atmosphere. Most visitors stop by for a couple of hours to shop or drink some mint tea, but it’s worth staying a bit longer to soak up the coastal city’s charm. Kairouan is the largest town in central Tunisia and, along with Mecca, Medina, and Jerusalem, one of Islam’s four holy cities. The Great Mosque was the first of its kind to be built in North Africa and is a popular pilgrimage destination. Many hours can be spent wandering amongst the streets and souks of the city. 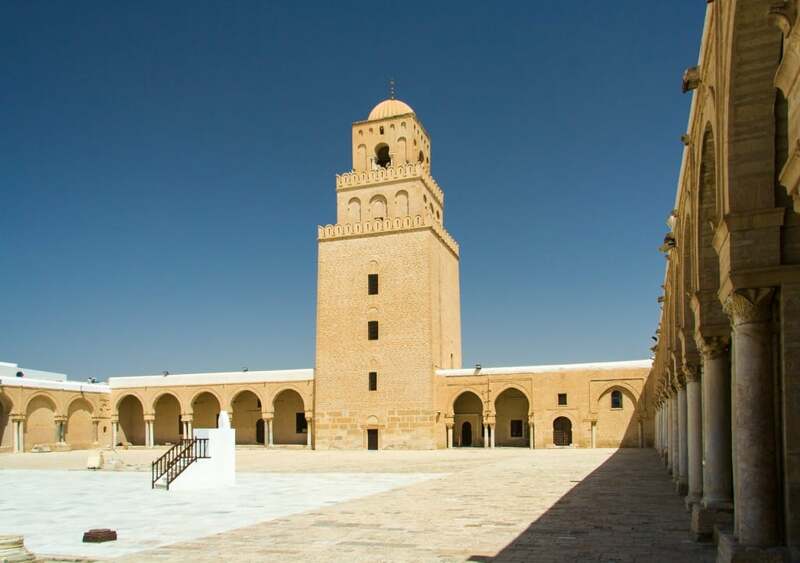 Kairouan is a UNESCO World Heritage Site. 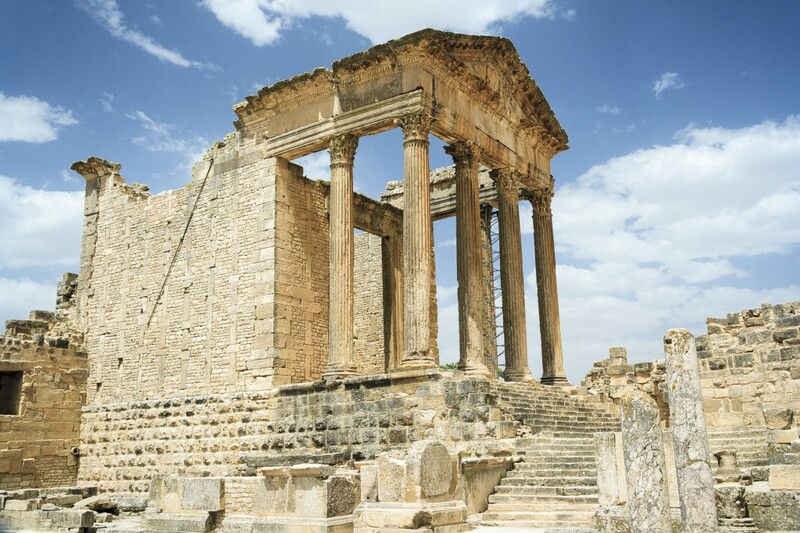 Dougga (also known as Thugga) is the best preserved Roman city in North Africa. Although pre-Roman monuments exist, the best known history stems from the time of the Roman conquest. The site contains many temples, triumphal arches, a theatre, several baths, and many residences. Dougga is a UNESCO World Heritage Site. El Jem is a small, quaint town in Eastern Tunisia, about two hours south of Tunis. There’s not much to see there, but the one thing that makes this trek worthwhile is its crown jewel: the Roman Amphitheater. Centrally located and difficult to miss, the 3rd-century Amphitheater is fairly large – third in size only to the Flavian Amphitheater (better known as the “Colosseum”) in Rome and the ruined amphitheater of Capua. The structure is in surprisingly good shape considering its age. ome of the stone blocks have been reclaimed for buildings throughout El Jem, while others were contributed towards the construction of the Great Mosque in Kairouan, but there is still plenty of structure left for guests to explore. The Amphitheater in El Jem is a UNESCO World Heritage Site. Located in northwestern Tunisia, Bulla Regia is famous for its underground villas, which were built to escape the fierce desert sun. Several of the villas contain elaborate mosaic floors which have been left in situ (others have been moved to the Bardo Museum in Tunis). Bulla Regia also includes a temple, baths, and a market square. Due to low tourist volume, you will often roam the ruins them in solitude. Bulla Regia can be easily reached from the coastal Phoenician city of Tabarka.